Home » Kitchen Help Category » Appliances, Accessories » Still in production after nearly 70 years: Acme Chrome Dinettes made from 1949 to 1959! 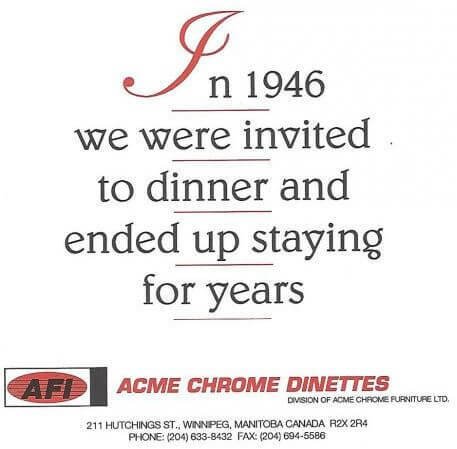 Still in production after nearly 70 years: Acme Chrome Dinettes made from 1949 to 1959! 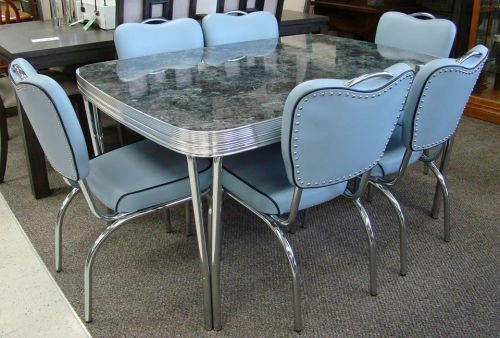 Are you looking for a vintage dinette but are having trouble finding just what you want? 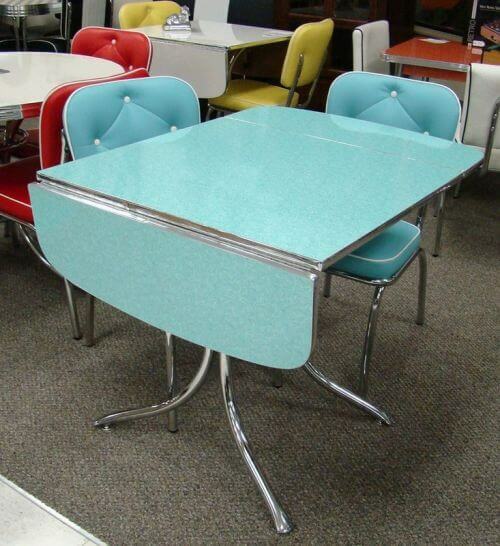 How about: Order a new dinette — made by a company using its original designs produced from 1949 to 1959. Yes: Acme Chrome Furniture Ltd. was established in March 1946 — and will celebrate 70 continuous years of business in two months! 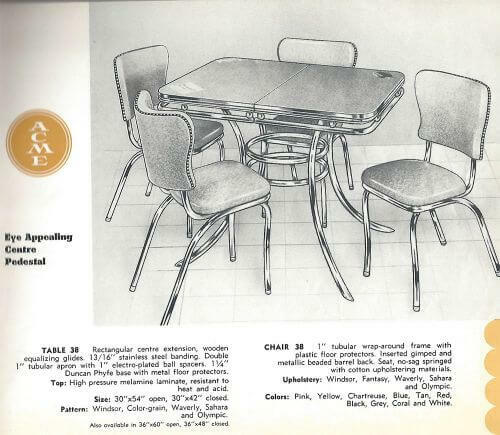 — and they are still making these dinettes today! 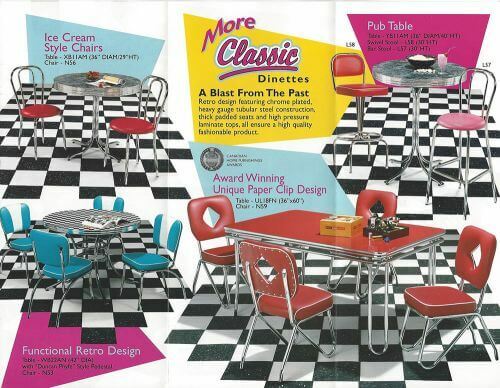 1950’s vintage catalog page illustrating products that have been included in Acme/ACCRO’s Classic Chrome Retro Dinette series re-launched in 1995. I spoke with Acme Chrome’s owner and president, Terry Clark, who was extremely generous with information and images about the history of the company — so we have a typically-epic Retro Renovation story to follow! 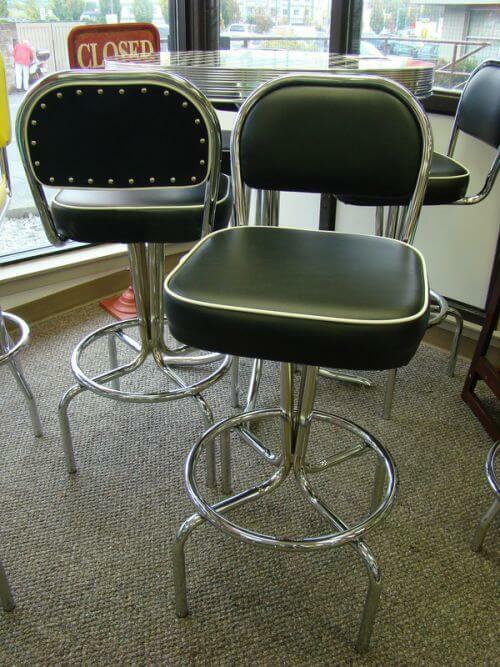 Note, today the dinettes are officially made by ACCRO Furniture Industries, which is a subsidiary of Acme Chrome. I use the two names interchangeably in this story — but tend toward Acme, because it was the original name — and oh so retro! 1950’s vintage catalog page illustrating products that have been included in Accro’s Classic Chrome Retro Dinette series re-launched in 1995. 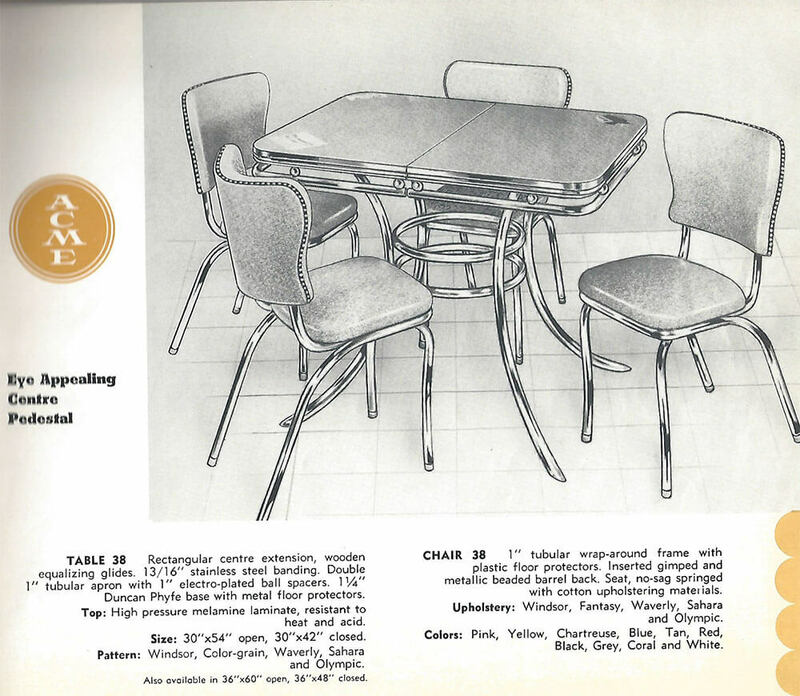 Clark told us that the production of these vintage dinettes actually paused in 1959, when consumer demand for these styles started to wane. But, the company made other varieties of metal furniture for other markets, so at no time did metal furniture production ever cease at the company. Then, in 1995, when the company was preparing for a move and had to pull the original tooling out of storage, enough years had passed that yes — what’s old was new again. 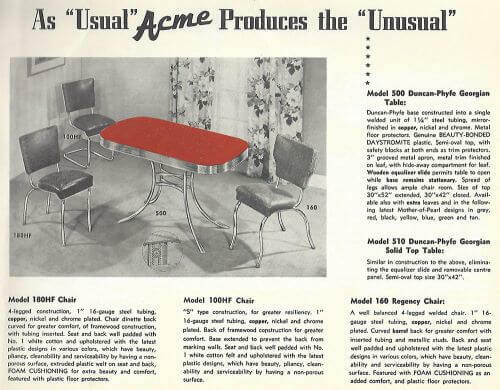 Retro design was starting to get more attention — Clark pointed to the reintroduction of Volkswagen Beetles — so Acme decided to put their dinette designs back into production. So hey, I don’t think we should call these “reproductions”! They are the same, real-deal designs from the heyday 1950s — still being cranked out today. I’ve read your blog for several years now – love it. 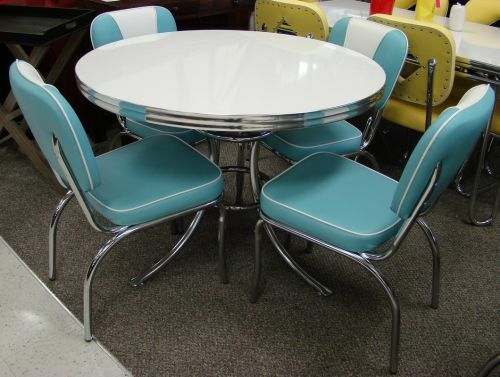 We just ordered a brand new retro-style dinette set (aqua boomerang laminate table and dark blue sparkly vinyl chairs!) from a Canadian company that has been making them ever since 1946, and I wanted to pass on the info to you and any of your readers who might be interested. 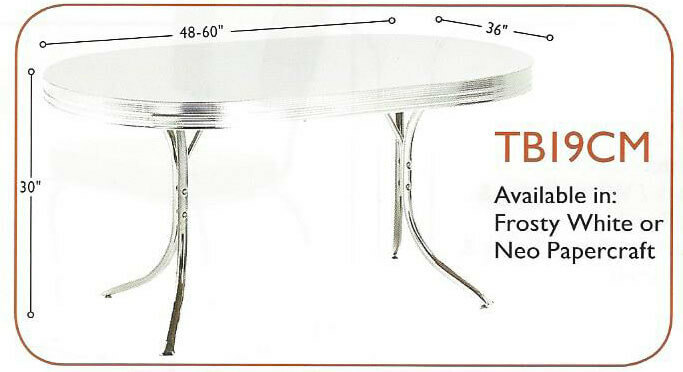 We ordered through Anmarcos Furniture in Courtenay, BC, but the manufacturer is ACCRO Chrome in Winnipeg, Manitoba. 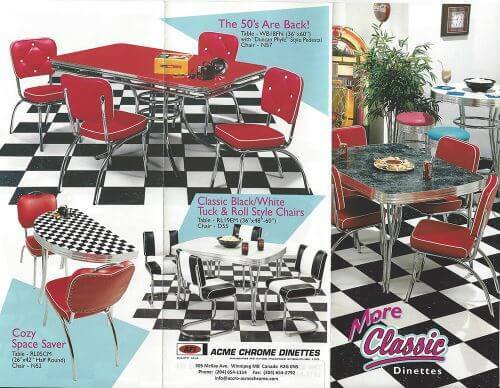 1950’s vintage catalog page illustrating products that have been included Acme’s Classic Chrome Retro Dinette series re-launched in 1995. Our company was founded in 1946, and the primary products manufactured in the early years included metal dinette sets for post-war residential demand. 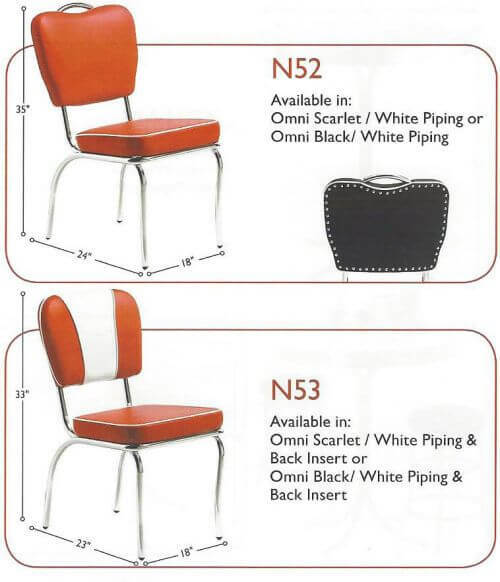 Our furniture product evolution actually followed the consumer demographic, initially from their homes to their work places, commercial restaurants, and then to schools, and eventually into health care facilities. As the decades passed, furniture for classrooms and extended care homes eventually became replaced with products mainly for public occupancy such as the quick service restaurant, hospitality, and gaming industries. 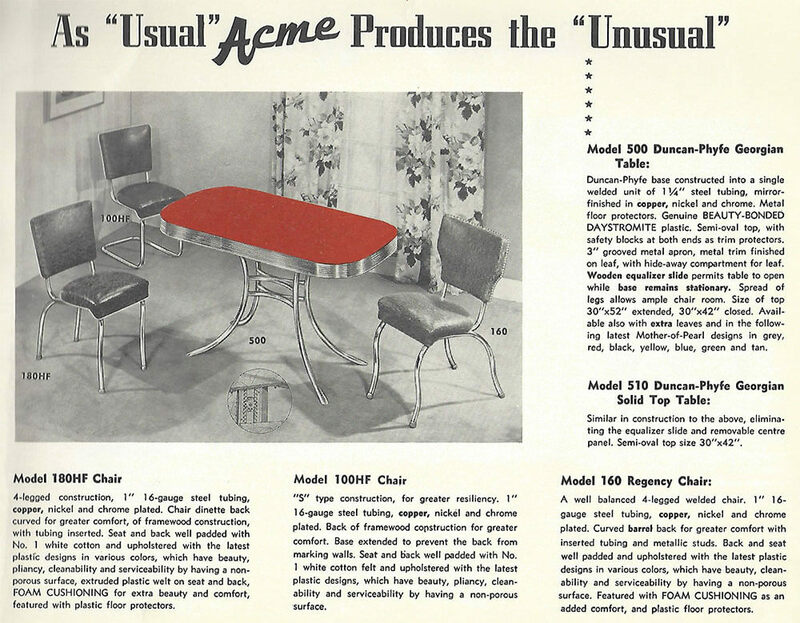 After discontinuing their dinette production after 1959, Acme continued in business, though. The company’s mainstay business then — and now — is in the commercial arena, supplying restaurants, educational facilities, other commercial spaces — even casinos, where you may be sitting on an Acme stool when you are playing the slots! 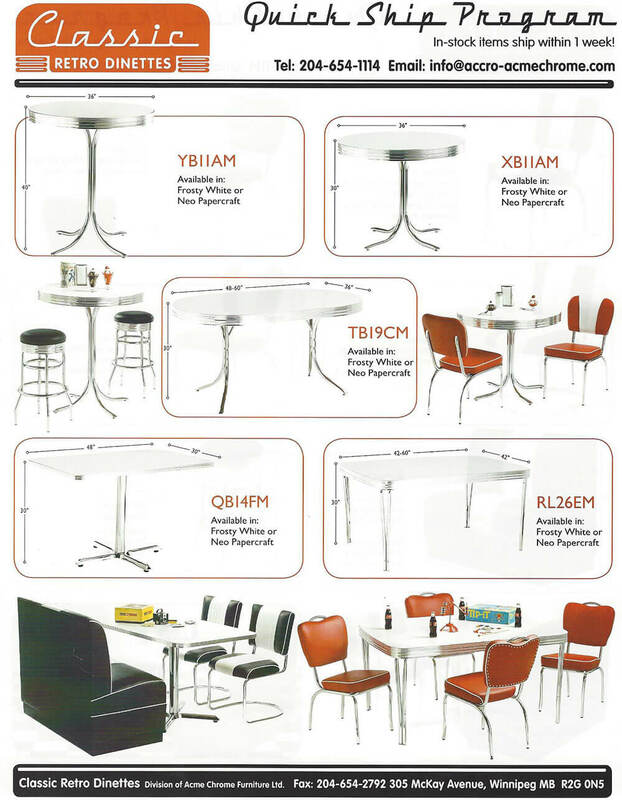 Former U.S. manufacturer Daystrom also re-launched a version of retro dinettes in the 1990’s similar to what they had produced in the 1950’s. Daystrom was purchased by Stoneville in the late 1990’s, but then Stoneville closed in 2002, and some of their former employees established Now & Then Furniture in Martinsville, Virginia. 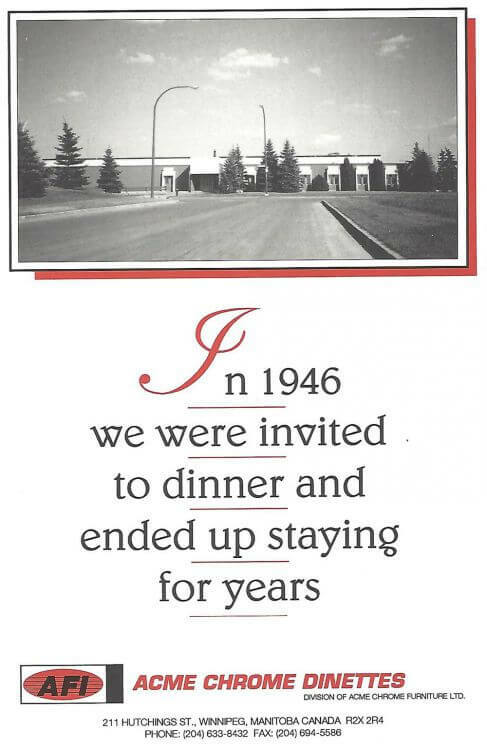 Our company purchased most of the assets of Now & Then Furniture when it closed in 2007. Chromcraft re-launched a retro dinette line at the end of the last century, which they produced until 2013 when they eliminated their U.S. manufacturing facilities. 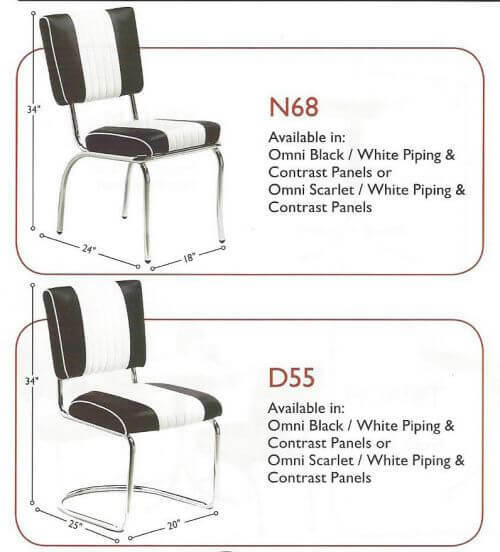 In the mid-1990’s we re-introduced our Classic Chrome Retro Dinette product line for which we have developed niche markets in North America and the U.K. 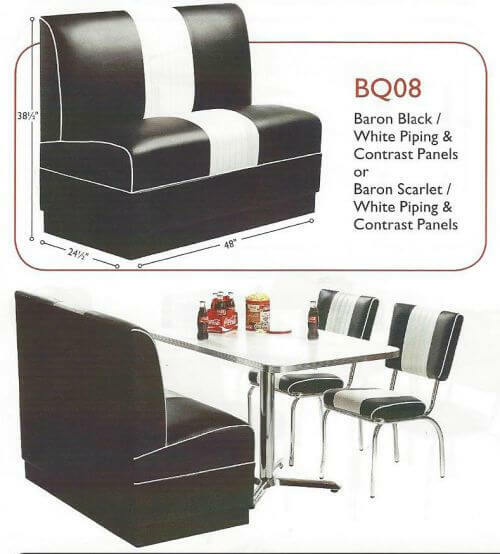 The Classic Chrome Retro Dinette program features designs replicated from our 1949 – 1959 product line, but manufactured with current technology and materials. High-pressure laminate of the ’50s (Arborite, Formica, etc.) was available mainly in a high gloss finish, which was susceptible to scratching from dishes, appliances, and normal everyday use. Today the laminates we obtain have suede finishes or protective surfaces which are much more durable and scratch resistant. The vinyl upholstery of the 1950’s was of a lighter weight than current materials, and usually did not have reinforced jersey backing like our vinyl does today. The result was that chair seats could split in transit due to extreme cold weather. 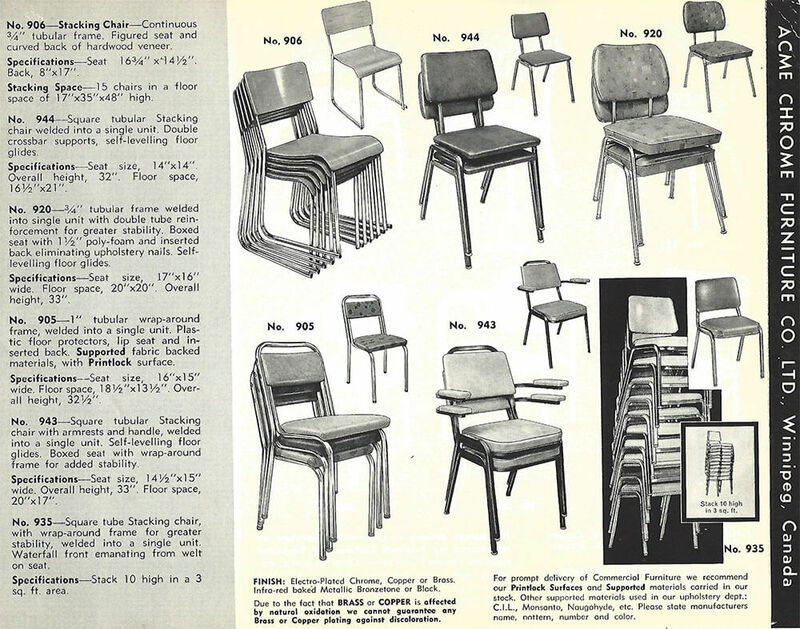 The chairs of that era used cotton padding, not nearly as comfortable as the polyurethane foam used today. 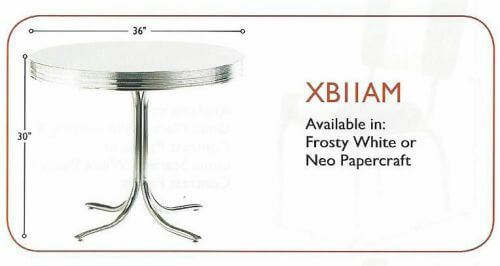 Products from the early contract or commercial furniture line, for the hospitality, office, and educational sectors. 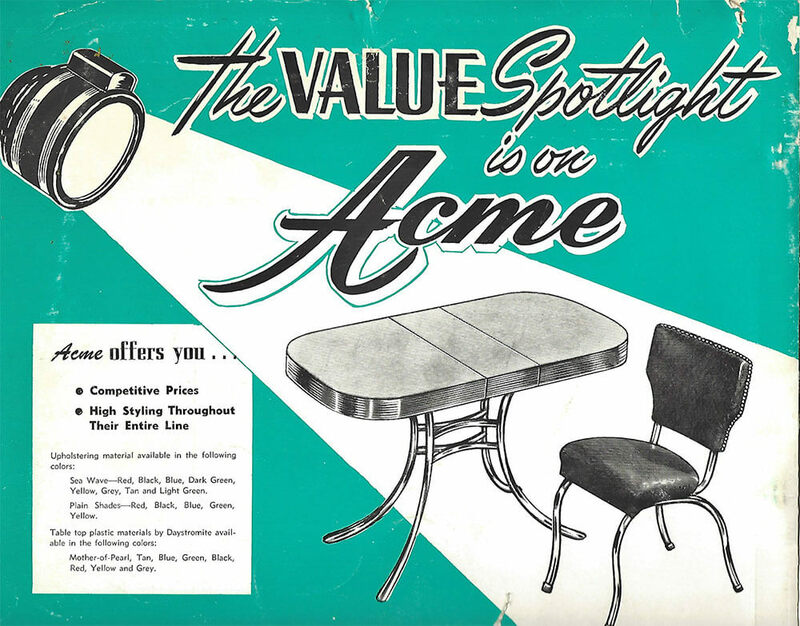 Commercial furniture products manufactured by the Acme company in the 1950’s following the successful launch of the residential dinette program. New factory the company moved in to in 1967. 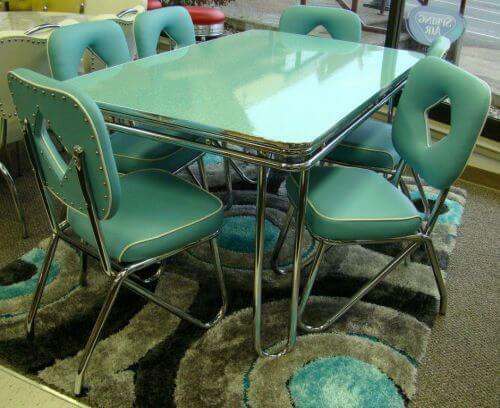 And get this: Available laminate table tops today include discontinued Formica boomerangs in aqua, coral and blue! All the glossy finish stock is gone, you can only get matte, but hey! Seems like Accro grabbed up a bunch when it was discontinued and still can put it on their tables. They also have nice vinyl options for the chairs. Our tubular steel is specified only in cold-rolled version for best nickel/chrome bright plating results. 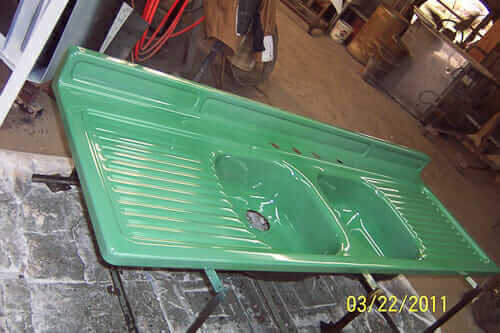 Less expensive hot rolled steel is used for powder coated (painted) finishes. 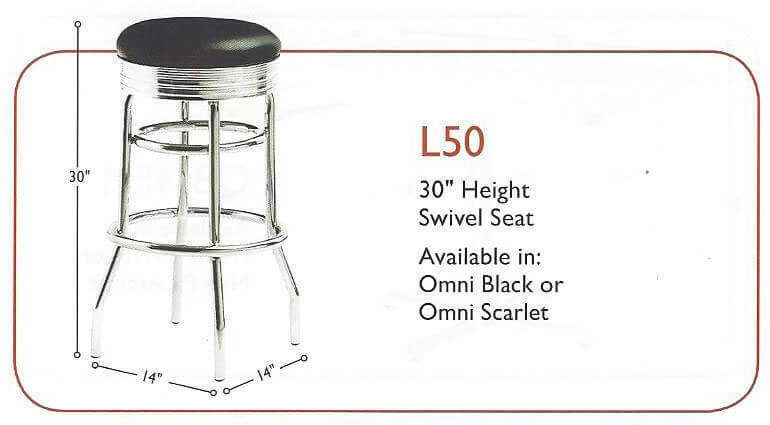 The chair and stool frames are all welded to provide maximum stability and durability, versus the mechanically fastened import products which are usually shipped KD [unassembled, “Knock-Down”] for consumer assembly. He also said that the company’s steel features 67% recycled content — from old railroad boxcars. Note: We are not Consumer Reports experts – so do your own research. 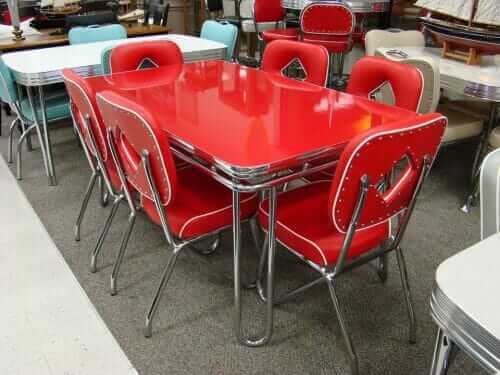 To be sure, you may be able to find a vintage dinette set that’s less expensive. But: It’s our experience that it’s becoming more and more difficult to find them, and even when you do, those chairs in particular took a beating and likely need to be upholstered, which is gonna cost you a pretty penny. So in this sense: We think the prices for Acme dinettes are very fair — providing a product built to your specifications. Dinettes on display at AnMarcos Furniture in B.C. Marc also noted that one of the seat cushions, which had taken a beating, was easily replaceable, too — he just ordered a new one from Acme and swapped it out. Marc said that over the past four years, the store has sold about 250 dinettes, mostly locally, because people like to touch and feel. But, he can also arrange for shipping anywhere in Canada — he’s sold a few more that way. He said they’re selling more and more every month — retro style continues to grow in popularity. Thanks to Marc for letting us grab some photos to show in our story. You can see more wonderful photos of dinettes on their showroom floor here, and also watch AnMarcos Furniture’s Facebook page, where they post new configurations when they come into the showroom. Thank you, Kevin, for this fantastic product tip. And many thanks Terry Clark, for all the terrific info and photos — we LOVE your company! What do you think of this awesome find, readers? Which design is thrilling you? 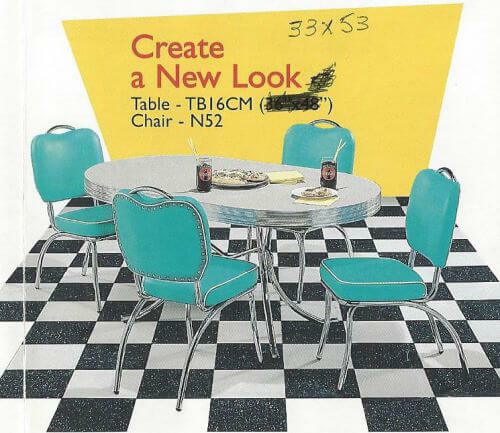 These also look great when you break up the sets, it takes away the 50’s diner vibe when the set is broken up. Really look at the design of these tables and chairs and imagine them on their own pulled away from the set, it opens up a lot more design options. I am still using an original table and chairs. Have been considering getting rid of it because the legs have rusted and pitted….please is there any way to refurbish them? I love my set, it is the perfect size and I have used it for so many years, ..as dining table..sewing table…laundry table…kitchen table and that is where it is now, but my kids keep telling me I should paint the legs or get a new one. Any suggestions???? I purchased an Acme dinette set two years ago when “retro-sizing” our cheaply constructed Euro-cupboard kitchen. UGH, is not a strong enough word! After a Google search of chrome sets, I discovered Acme on-line, and found that I actually live in the same city where they’re produced, Winnipeg, Manitoba, Canada. You can’t order directly from the factory, but there are two stores in town where you can order them. You choose the style, the colour, and they make exactly what you want. YAH! 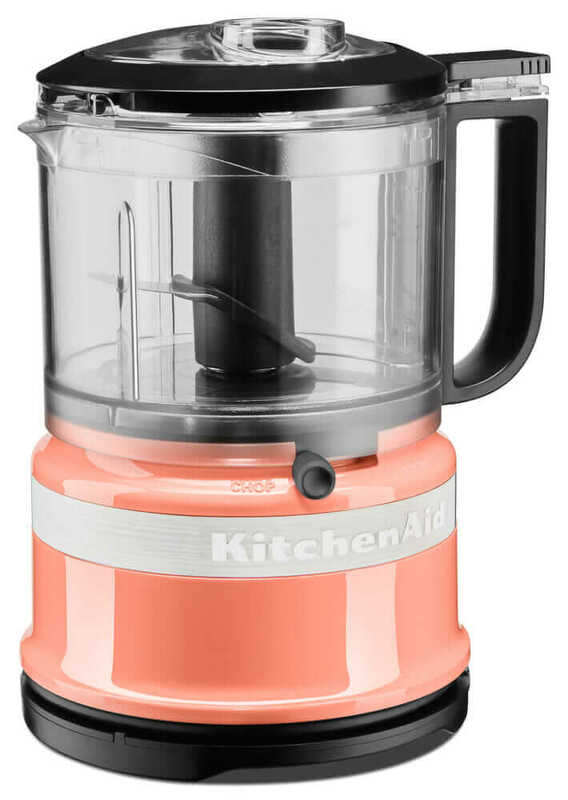 I had previously ordered retro-look appliances (Northstar Appliances, another Canadian company) in Robin’s Egg Blue. They hadn’t arrived yet, so wasn’t exactly sure how they’d look. Interestingly enough, the chairs to our dinette set are an exact match to our appliances! Our kitchen is more 40’s inspired than totally true to the late 40’s, but we love it. And sure, these dinette sets aren’t cheap (neither were the appliances), but they’re built like tanks… super industrial strength, and should last a lifetime. At least my lifetime! 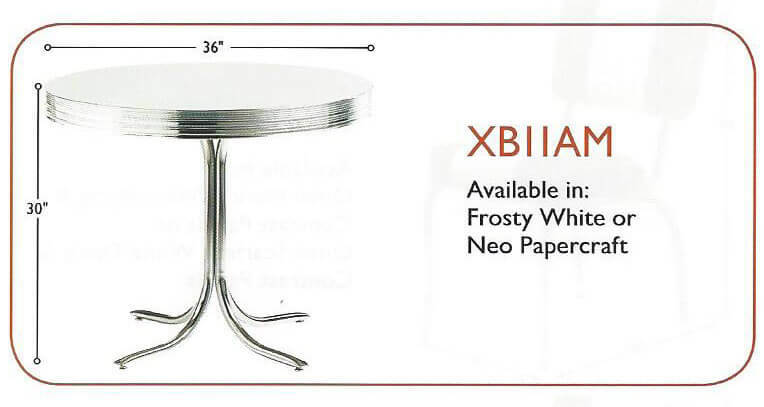 Now if they only made the outlandish table-top patterns and designs of the 40s and 50s – that would really be something! 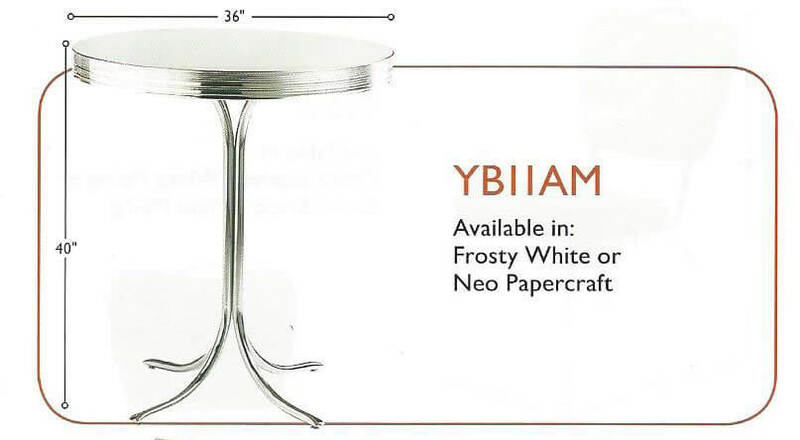 We are looking for more than just a plain table-top. The checkerboard pattern is fun but not what we want. We have an awesome atomic set in near mint condition but like others have said, it seems to be made for adults the size of kids. Any suggestions? 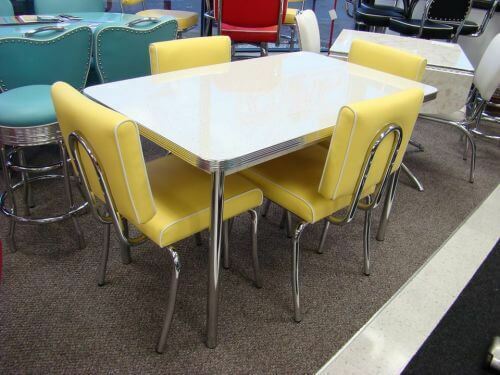 Does anyone still make custom formica table-tops that replicate the golden age of the chrome dinette sets? THANKS! They do have quite a variety of different laminates in different colours and patterns. They have the boomerang pattern for sure. We ordered the solid one piece top, but you can get them with leaves for expansion too. Really well made, in lots of styles and colours. Great article. Everyone needs a little more retro in their lives. Thank you.